It is fitting to celebrate Jesus’ triumphal entry into Jerusalem on Palm Sunday. We rejoice to see the holy city roll out the red carpet and hail Jesus as the promised Messiah. The problem is, however, that the only crown they gave their king was a crown of thorns. This week the Church recalls a far more important victory procession. The Solemnity of the Ascension celebrates the triumphal entry into the heavenly Jerusalem, the true and eternal City of God. The inhabitants of that city did not cry “hosanna” one day and “crucify him” the next. Suffering is over. Death has been defeated. There is nothing left for Christ but glory. All during his public ministry, he had spoken of some mysterious “Kingdom of God.” He was speaking not so much of a place, but of a new era, the period of the “Reign of God.” But a new reign must begin with a coronation, just as a new presidential administration must begin with an inauguration, though the election had been won months earlier. The prince may be heir to the kingdom from birth, but until he puts on the crown and takes his seat on the throne, he cannot exercise his authority. 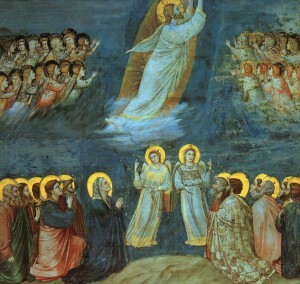 The Ascension celebrates this momentous occasion. Myriads of angels sing a new song of indescribable beauty as the one who is both son of God and Son of Adam takes his seat at the right hand of the Father and is crowned King of heaven and earth. Note that in our first reading from Acts, Jesus, right before he ascended, tells them to wait for the promise of the Father. They think this means a political coup is about to take place whereby Israel regains the dominance it formerly enjoyed under David and Solomon. Jesus corrects them gently. He has in mind something much greater. He is about to receive the authority to pour out upon them the very power of God, the same power that had raised him from the dead (Eph 1:19-21). These ministers were about to be empowered to help their King build a far wider and more long-lasting empire than Solomon’s. The Kingdom of God would be a worldwide, eternal reign of freedom and joy for all those who would accept the king’s sovereignty and be washed in the saving waters of baptism (Mark 16:15-16). Talk, as they say, is cheap. Jesus did not just talk about Good News, he was good news changing sadness around him to joy, darkness to light. So his preaching was accompanied by signs and wonders. In this week’s gospel, Jesus describes signs that will accompany those who believe and carry the good news to others. Some have claimed that such signs and wonders were necessary in the early church to get things the ball rolling during those dark days of paganism and brutality, but are no longer to be expected today. Several fathers of the Second Vatican council took issue with this idea, noting that there is as much brutality, darkness, and opposition to God today as there was in the first century. The council therefore taught (LG 12) that the Holy Spirit still pours out his gifts upon the faithful of every rank, and that these gifts are to be received with eager gratitude. Some of these gifts empower us to be like Christ. We call these virtues. Others empower us to serve others as He did. These are called charisms. Whether remarkable, like healing, tongues, and prophecy, or humble, like hospitality, they are all moving signs of the Kingdom of God. It is not ours to determine which charisms we’d prefer to have. Our job is simply to use the authority and power that has been given to each one of us to the very best of our ability, remembering that to those faithful in small matters, even greater things are given.